I sold my first item on eBay about 13 years ago. And that just happens to be the last time I sold an item, too. I didn’t like having to figure out what to set the price at, I didn’t like having to deal with a slow-to-pay seller afterward, and I didn’t like having to scrounge up a box to ship something cross-country. It wasn’t a simple, streamlined procedure. eBay may never quite reach the level of ease and simplicity I’d prefer, but a new startup called Sold is trying to reinvent – and perfect – online selling. Once you provide the Sold iPhone app with a picture and brief description of what you want to see, the service will help you price the item, sell it for you, and handle all the hassles of shipping and payment. All you have to do is watch for Sold to deposit the cash directly to your bank account (after the company takes its cut, of course). There’s a little bit of a catch, however: Sold doesn’t want your trash, it wants things of actual value. That’s why the service is trying to focus on designer items, like that pair of Ray Bans you haven’t worn since 2007, your stash of designer kids' clothes, your old iPod touch, or last year’s smartphone. To that end, Sold provides three different sized boxes, one of which must fit your item. Sold may not be the most charitable way to get rid of your old items, and it may not net you the most money, but it does aim to be the easiest. Once the service prices and sells your item for you, Sold will send you a pre-labeled, pre-insured, pre-paid box filled with protective packing materials like bubble wrap and tissue paper. You don’t need to worry about collecting the money or waiting in line at the post office – Sold takes care of that stuff for you. 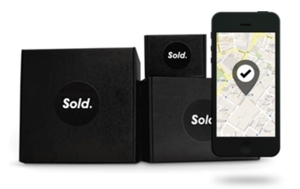 All you have to do is put what you sold in the box, and open up the Sold app to schedule a pick-up appointment. The Sold app is free for download for the iPhone, iPad, and iPod touch on Apple iTunes. Seriously, I am in the market for those Bose headphones! I bought the cheapos by Sharper Image - and they lasted about 5 years. I’m legit Fox, check out our website and if you haven’t posted on Sold - maybe we can work something out? I’m in NoCal.